Green Bay Packers’ Clay Matthews sacks Atlanta Falcons’ Matt Ryan during the second half of an NFL football game Monday, Dec. 8, 2014, in Green Bay, Wis.
Now that the dust has settled on the penultimate week of the NFL season, 10 teams have clinched playoff spots and 16 more have been eliminated. The Eagles sat at 9-3 through Week 13. From 1990 to 2013, just two teams, the 1993 Miami Dolphins and the 2008 Tampa Bay Buccaneers, managed to miss the playoffs after starting with that record. The 2014 Eagles now join them, dropping three straight to Seattle, Dallas and, worst of all, lowly Washington, thanks to two field goals missed by Cody Parkey and a killer Mark Sanchez pick. If Atlanta beats Carolina at home — the Falcons are currently favored by around 4 points — they’ll make the playoffs as the under-.500 champion of the lowly NFC South. This would make the Falcons the first 2-6 team and the first 5-9 team to make the playoffs since 1990. They’d become the second team to make the playoffs despite incurring a five-game losing streak during the season. And they’d do it despite winning only one game outside their division — they are 1-9 outside the NFC South and 5-0 within it. This sort of mediocrity could be short-lived. The first and only 7-9 team to make the playoffs was the 2010 Seattle Seahawks, a member of the 14th-worst division in the history of the NFL. Three seasons later, the Seahawks were Super Bowl champions and the NFC West was the second-best division in NFL history, winning 30 of its 40 non-division games. 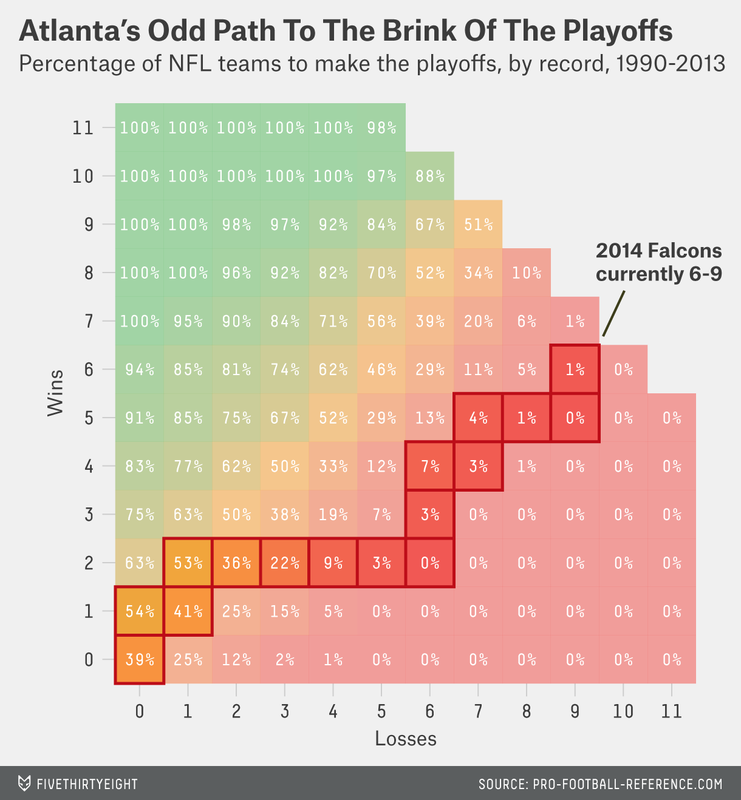 Make fun of the Falcons — and the NFC South — while you still can. Speaking of, time to get in our NFC South shots. Going into Week 16, the teams in the NFC South had 9.5 wins against non-division opponents in 38 chances this season (counting Carolina’s tie against Cincinnati as half a win). That .250 winning percentage matched the 2008 NFC West, which ended the season with just 10 non-division wins. Last week, Tampa Bay did its part by getting smoked by the Green Bay Packers, but a fourth-quarter Carolina comeback against Cleveland pushed the division to 10.5 wins, giving the NFC South a .263 winning percentage. The NFL dominates the list, claiming 16 of the 17 worst divisions. The 1978-79 Smythe Division in the NHL takes the fifth spot (.290 non-division winning percentage), and the 1971-72 Central Division in the NBA comes in at 28th (.353). You have to go all the way to 94th to get to the first MLB division on this list, the 2002 AL Central (.412). Of course, the NFL plays a lot fewer games than the other leagues, and its divisions have fewer teams in them (just 4.4 teams on average since they were instituted, compared to the NHL’s 5.2, MLB’s 5.6 and the NBA’s 5.7.) It’s “easier” for a mediocre division to lose 30 out of 40 games than it is to lose 300 out of 400. The NHL’s 1978-79 Smythe division stands alone here, with about a 1 in 162 billion chance of secretly being average. It’s immediately followed by the 1977-78 Smythe, the 1975-76 Smythe and the 1976-77 Smythe. The ’70s were a dark period for fans of the Black Hawks, Canucks, Blues, North Stars and Scouts/Rockies. MLB sneaks into the Top 25 with the 2002 AL Central’s odds of 1 in about 7,000 of being average. The first NFL division doesn’t come until the 39th spot. The smaller sample actually helps here, as an NFL division would have to go 0-40 in non-division play to beat the terrible 1978-79 Smythe, and 4-36 (.100) to beat the 2010 Atlantic in the NBA. There are other mathematical ways to go about this, and one could also argue that the NFL’s small sample size means that non-divisional records aren’t necessarily a great measure of quality. 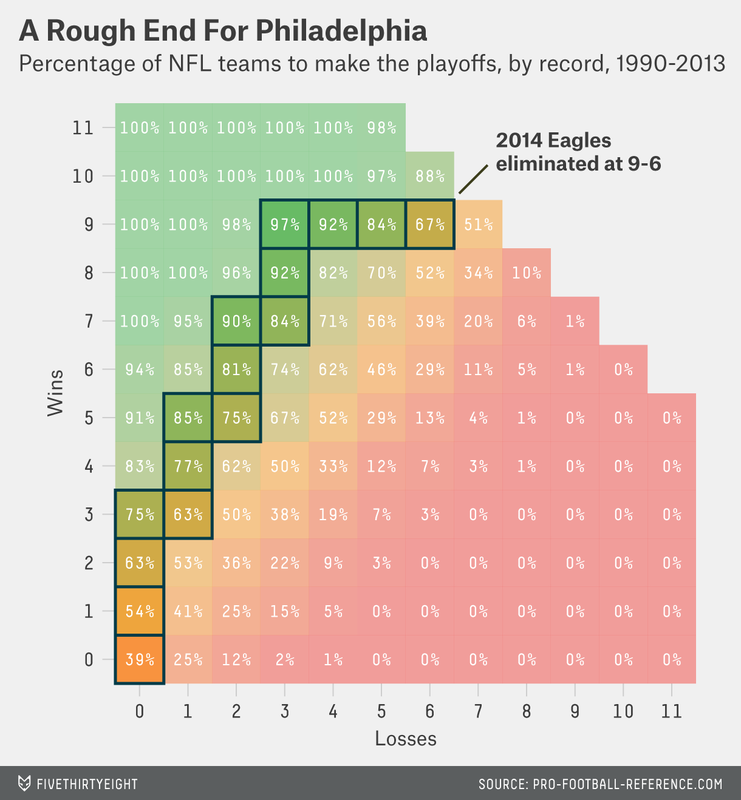 (The 2014 AFC South has a lower cumulative Elo rating than its NFC equivalent.) For now, let’s agree that the Smythe Division was pretty bad in 1978-79 and so is the NFC South in 2014. Week 16 is a great time to make fun of terrible preseason predictions, but some pundits got it right. The 2014 wide receiver draft class was touted as one of the best and deepest in NFL history.3 It has certainly lived up to the hype. 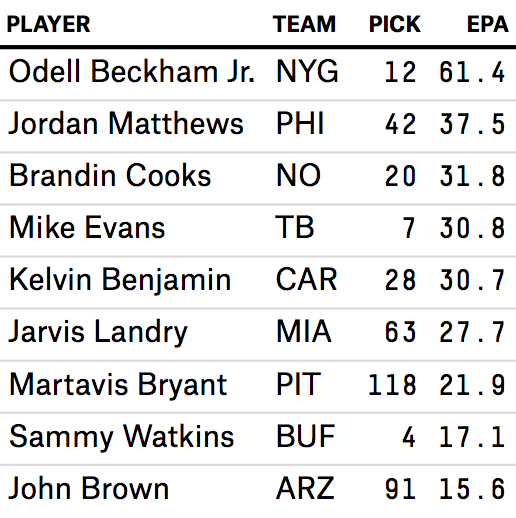 Odell Beckham Jr. has been the most dominant, but he’s far from the only rookie receiver to have an immediate effect. The table on the left shows the draft pick and expected points added (from Advanced Football Analytics) for the nine best rookie wide receivers in the league. Note that the New Orleans Saints’ Brandin Cooks suffered a season-ending injury in Week 11, truncating his production. He was arguably the Saints’ best receiver up to that point. 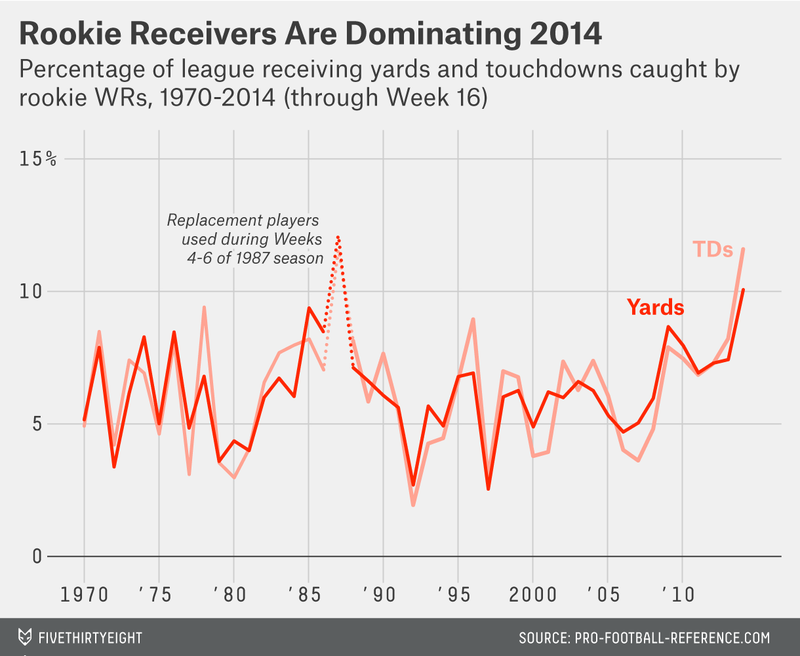 This season, rookie WRs have contributed 10.1 percent of the league’s receiving yards and 11.6 percent of its receiving touchdowns. Those are the highest figures since the merger, excluding the 1987 season, when replacement “rookies” were brought in from Weeks 4 through 6 to break a players’ strike. The chart above shows the yards that Calvin Johnson (2012), Michael Irvin (1995), Dwight Clark (1982), Bill Groman (1961) and now Odell Beckham Jr. (2014) accumulated during their respective streaks. Johnson is the only one to top Beckham’s yardage through eight games, and that 2012 run is probably the best stretch of receiving in NFL history. 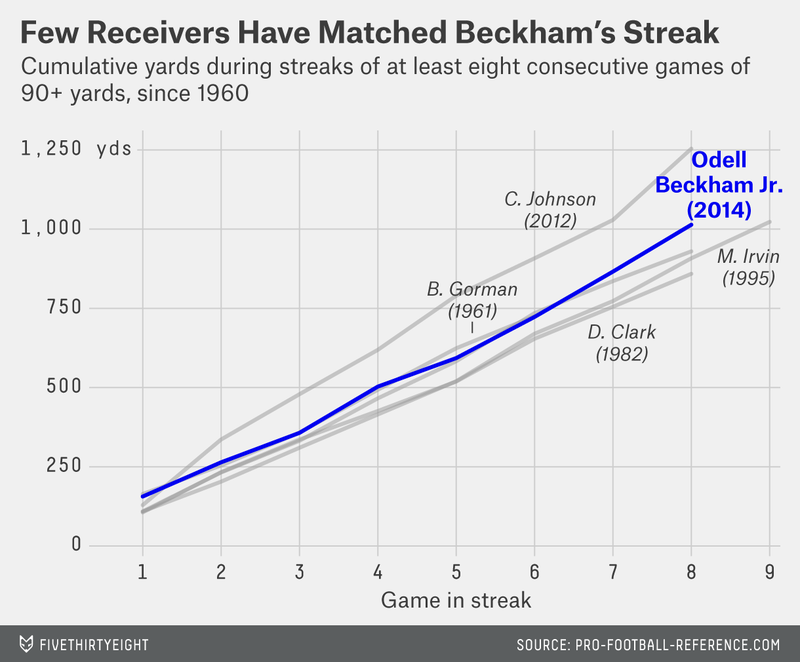 In Week 17, Beckham will try to tie Michael Irvin’s streak of nine games, against the Eagles in a game of no other real consequence. In fact, a lot of games are of very little consequence this week. Thanks to Philadelphia’s loss to Washington, the NFC wild-card race is already wrapped up, while Cincinnati’s Monday night win leaves just one spot available in the AFC. If you root for one of the 14 teams with playoff berths or seeding on the line (or one of the two in contention for the top draft pick), you can check out some Week 17 game scenarios in the interactive below. For everyone else, enjoy your week off. I performed a similar analysis of “worst divisions” last year for Deadspin, but I didn’t take out games won within each division. Whoops! 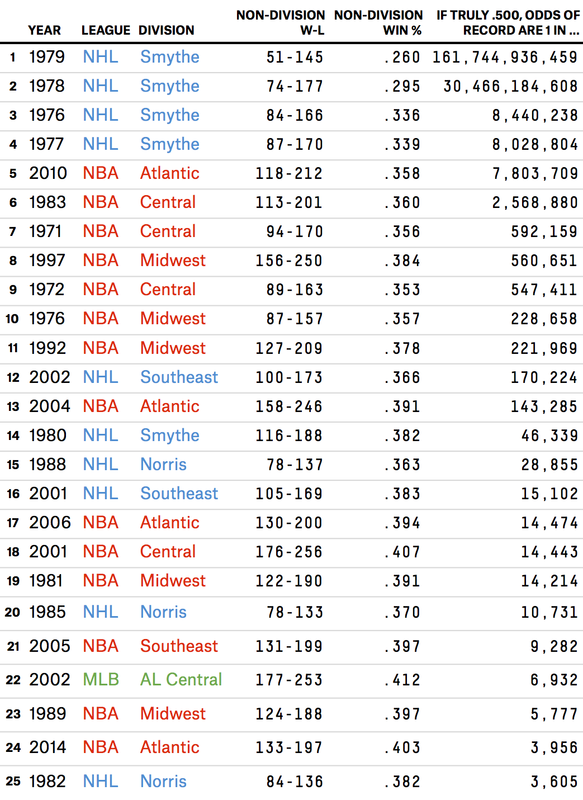 Also note that for our purposes I’m considering “divisions” to be league organizations that divide teams into more than two groups — the NBA East and West “divisions” before the 1970-71 season are pretty much what we now consider conferences. In all, there have been 296 division-seasons in the NFL (since 1970), 190 in the NBA (since 1970-71), 226 in MLB (since 1969), and 185 in the NHL (since 1974-75). Ties were counted as half a win, and the NHL’s silly overtime loss points were counted simply as losses. Not by everyone; here’s one more prediction to make fun of.